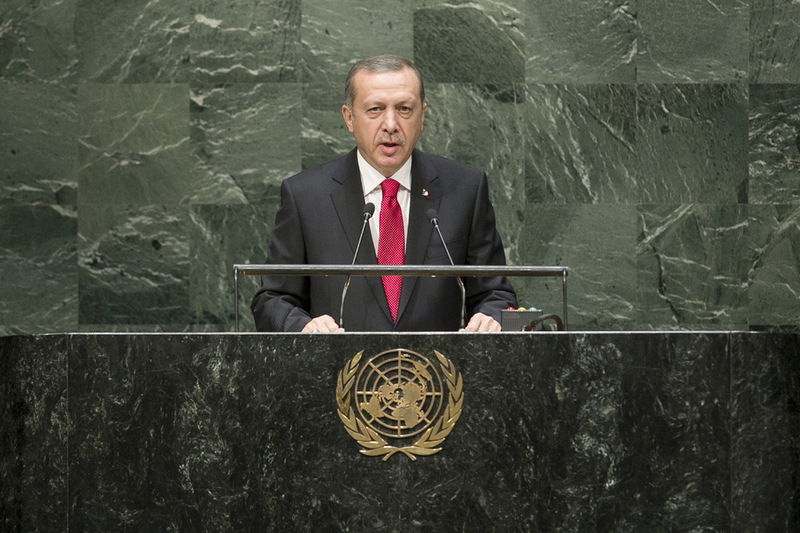 Recep Tayyip Erdoğan, President of Turkey, said the current session was being held on the 100th anniversary of the First World War, whose effects still deprived peoples of stability, peace and prosperity a century later. A broad swath of nations, ranging from Iraq to Syria, Libya to Afghanistan and Ukraine, witnessed deep scars on the conscience of humanity. Poor countries struggled with hunger, malnutrition, communicable diseases and lack of education, while rich ones enjoyed prosperity. Climate change threatened the whole world, and because those issues concerned all of humanity, they were the purview of the United Nations. He said that millions of children worldwide had lost their lives in the last year, and 17,000 of those killed had been in Syria. Others had been severely injured. This year, 490 children had been killed so far and 3,000 injured as “a direct target” in the Gaza Strip of Palestine. Children playing on beaches, running in parks, taking refuge in mosques or schools, or curled against their mothers’ bosoms, were mercilessly killed before the eyes of the world. However those objecting to murders in Iraq and Syria were subjected to certain unfair and groundless accusations, and immediately accused of supporting terrorism. Those who stood by and remained unresponsive to the killing of children and women were openly participating in those crimes against humanity. That double standard, he said, led to significant and serious mistrust, including towards the United Nations; it harmed a sense of justice and led millions of people to despair. And that mistrust was one of the main sources of power for the growth of international terrorism. Indifference to the killing of children was a lifeline for terrorism all around the world. Problems in Iraq had caused major destruction for the Iraqi peoples and had recently spread beyond its borders. Unfortunately, that had given terrorist organizations free reign in the region, which had a direct effect on countries there, particularly on Turkey. Hopefully, a new Government in Iraq would mean a fresh start, he said, regretting that the Syrian crisis was now spilling over the borders of Iraq as well. Achieving a two-State solution for Palestine was of utmost importance, he said, stressing that it was no longer time to speak to the issue only, but to act. Thousands of people were dying from inaction, he declared, urging the United Nations to address those problems without further delay. The “world was more than five”, he said, adding that the situation in the Security Council was not acceptable, given that decisions taken at the United Nations could be dependent on a single country. The Organization had been unable to find effective solutions regarding the conflicts in Palestine, Syria and elsewhere, and could have prevented so many deaths. He did not understand how the killing of 2,000 civilians by chemical weapons was a crime while the killing of 200,000 by conventional weapons was not. All killings were crimes regardless of weapons used. The United Nations had done nothing but watch events unspool in Egypt, and the person committing a coup was legitimized. If that was a legitimate path to power, why did the United Nations exist at all? He strongly condemned coupling terrorism with Islam, which represented peace, adding that those labelling their inhuman actions as Islamic disrespected Islam and all of humanity. Turkey was approaching issues in its region on moral grounds, and not on the basis of religion or race, he said, noting that 1.5 million people had come to Turkey and were receiving food and medicine. Unfortunately, however, the rest of the world was not supplying much support. So far, Turkey had spent more than $4.5 billion on Syrian refugees; he wondered why only 130,000 were being served by European countries. The Syrian crisis was a global one to which it was impossible to remain indifferent. Turkey had always retained its objectivity regarding terrorism, sectarian conflicts and rights protection. It fought terrorism itself. It opposed anti-Semitism and all forms of racism, which were crimes against humanity. So too was Islamophobia. Turkey would fight for democracy and prosperity with heart and soul, he said, urging the world community’s support for its pursuit of a non-permanent seat on the Council.